Words for simple body movements – Ideal for literacy word games and classroom bulletin boards and display….. 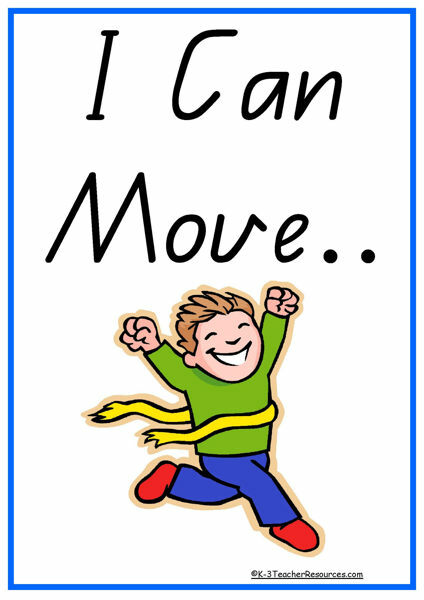 Refer to these words to make an ‘I Can Move ‘ Alphabet Book‘ using the ‘I Can Move’ front page. Brainstorm and list more action words as a class. Classify the movement words into different parts of the body eg. eyes – wink, blink etc. One child performs an action – another child has to find the action card to match. Make mini copies of these words for children to become ‘word detectives’ andplay with the laminated words – circling, colouring phonics etc. These smaller sizes are also great for cut and paste activities such as cutting out the words and pasting them in alphabetical order.